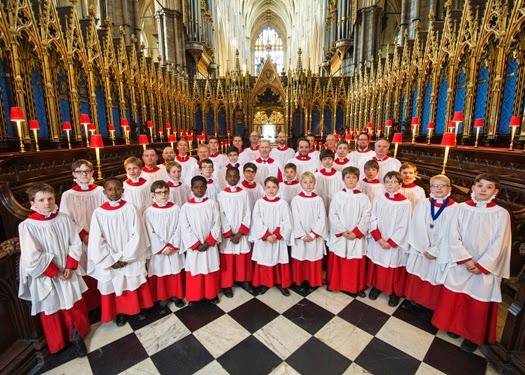 The choir of Westminster Abbey does not make many concert appearances, their performing life is intimately bound up with the building in which they sing daily services. With their conductor James O'Donnell and organist Daniel Cook, the choir made a rare appearance at the Cadogan Hall on 11 December 2014 performing a programme of music for Advent and Christmas. Whilst the theme of the concert was seasonal, O'Donnell's choice of music included some seriously chunky pieces without the sense of frivolity which can beset such programmes. In the first half, themed on Advent, we had Byrd's Vigilate and the Magnificat from the Great Service, plus two responds Sheppard's Verbum caro factum est and Tallis's Videte miraculum, and two verse anthems Bull's Almighty God and Gibbons' See, See, the Word is Incarnate. The second half opened with Poulenc's Quatre motets pour le temps de Noel before moving into more traditional Christmas fare with Howells A Spotless Rose, Matthew Martin's Dormi Iesu!, Head's The Little Road to Bethelehem, Rutter's What Sweeter Music and Sans Day Carol, Parry's Welcome, Yule! and The Holly and the Ivy. By modern cathedral standards, the Abbey choir is a large one and at Cadogan Hall they fielded 12 singing men and 22 boy trebles. The trebles ranged in age from around 7 to 13 and dressed in their traditional red surplices and white ruffs, gave the concert an additional aah factor even before they opened their mouths (the men wore red surplices but thankfully were spared the ruffs). It isn't just the choir's working life which is bound up with the Abbey, its very sound quality is too. They make a firmly vigorous and robust sound which is intimately linked to ensuring the music's impact in the Abbey's resonant acoustic. James O'Donnell was previously at Westminster Cathedral so it is perhaps not surprising that the Westminster Abbey trebles make the sort of strong, direct and focussed sound which has been referred to as 'continental'. I am not entirely certain that the rather dry Cadogan Hall acoustic, which does rather favour smaller vocal ensembles, responded well to the choir's sound and there were moments which seemed less than flattering. Tone which could sound firm and strong in the Abbey occasionally came across as forced, and the men's use of vibrato lent a rather virant air to the sound which was a long way from current period practice. Watching and listening to the choir there was an interesting disjunct because in style O'Donnell is not a vigorous conductor, his hand gestures were neat and precise shaping the music carefully yet the sound which they drew forth from the choir was full and vibrant. We are so used nowadays to hearing Byrd, Tallis et al sung in concert halls by ensembles of around 8 singers that hearing the music sung so vigorously by 12 men and 22 boys is something of a shock. Byrd's Vigilate had a sense of continuously moving and interweaving lines, creating a highly characterful texture rather than a sense of individual line, and there was a lovely attention to rhythmic detail. O'Donnell took Tallis's Videte miraculum at a relaxed tempo.There was a good sense of richly prrojected lower parts complementing the vibrant top line. Sheppard's Verbum caro was similarly vigorous and robust, these were certainly not precious performances. The Magnificat from Byrd's Great Service had a slightly more relaxed feel than the previous items, though I could have wished it was more so. There was occasionally a sense of smudged interior detail; perhaps adding a concert to the choir's busy Advent and Christmas schedule rather stretched things. For Bull's Almighty God solo sections alternated with tutti, accompanied by Daniel Cook on a chamber organ. We started with a pair of highly characterful trebles, and throughout the various soli showcased individual members of the choir finely. The same was true of Gibbons' See, See, the Word is Incarnate which opened with a lovely tenor solo. Both the Bull and the Gibbons had some lovely calmly lyrical moments, with the livelier sections having a nice rhythmic felicity. The second half opened with Poulenc's Quatre motets pour le Temps de Noel, short but intense pieces. And Poulenc's precise, at times dry, style seemed to suit the Cadogan Hall acoustic. All four motets were sung with perky rhythms allied to the right sort of dead-pan insouciance that the music needs. The final Hodie Christus natus est was suitably celebratory, though I thought perhaps some of the detail might be smudged. Howells A Spotless Rose made a fascinating comparision of Siglo de Oro's performance of the same work at the Spitalfields Music Winter Festival on Tuesday (see my review). Where Siglo de Oro had concentrated on beauty of tone and lyrical line, O'Donnell and his singers gave us music that was extremely characterful and expressive, complemented by a lovely baritone solo. The overall effect was far from self-indulgent and rather refreshing. Daniel Cook moved to the piano for Dormi Iesu! by Matthew Martin. Martin's setting of this little Latin lullaby seemed inspired by Hindemith and the overall result was rather unsettling (more a presage of Christ's death than a cradle song) with the unresolved ending unnerving the audience so much that they entirely failed to applaud. We were back on more traditional ground for Michael Head's The Little Road to Bethlehem which showcased the trebles beautifully. John Gardner's Tomorrow Shall be My Dancing Day had a lovely sense of restraint allied to crisp rhythms. Walford Davies arrangement of The Holly and the Ivy was imaginative and appealing, and again showed off the individual voices of the choir as two trebles, and a tenor and a bass various took solo roles. Christmas would not be Christmas without the music of John Rutter and accompanied by Daniel Cook at the piano, the choir performed to charming pieces What Sweeter Music and Sans Day Carol. The concert was rounded off with Sir Hubert Parry's lively Welcome, Yule! which the choir sang with appealing brilliance. The packed audience was enthusiastic and the group treated us to an encore, Ding Dong Merrily On High. By the way, it was a shame that no-one warned the organ tuner that the chamber organ would not be used in the second half, as he spent the interval painstakingly (and painfully for the audience's ears) re-tuning the instrument. The choir is singing regularly at Westminster Abbey until (and including) Christmas Day.